Benjamin was a baseball player. The young teen ran and played hard, enjoying the game as much as the sweat. But when he had to have a limb salvage operation in his leg due to cancer, it ended his hopes of playing a competitive sport. Then, one month ago, his hospital caseworker, cancer survivor Jenee Areeckal, convinced him to attend a tennis clinic at Biola University for cancer patients who have lost limbs. Although reluctant to go, by the end of the clinic Benjamin realized he could compete in a sport once again. “His chemo makes him weak, but tennis is giving him something to look forward to,” said Biola’s women’s tennis head coach, Dee Henry. Henry started coordinating the clinics three years ago after visiting Children’s Hospital of Orange County [CHOC] and meeting Areeckal. As Areeckal battled through chemotherapy, a friend suggested she spend an afternoon with Henry on the courts. They met shortly after and played for hours. The second annual clinic at Biola, in honor of Children’s Cancer Awareness Month, was held Sept. 18, 2010. Benjamin is one of the young people this program is giving hope to. 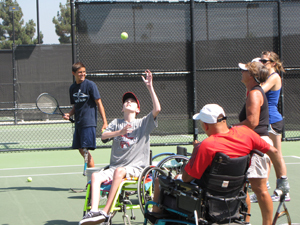 So far, he has attended two other clinics that Henry holds for wheelchair tennis players on Monday nights at Biola. She sees him going far in the game. The clinics serve as an introduction to tennis for most of the kids and provides a change of scenery where the attendees can use Biola equipment, practice on collegiate tennis courts and learn from Biola’s varsity tennis players. Biola junior Danielle Calbeck was one of the varsity players who assisted at the clinic on Sept. 18. She helped players warm up and was able to volley with them as well. The involvement of Biola’s student athletes is one of the reasons Henry continues the clinics each year, saying each of the students involved reported having an amazing experience. Calbeck enjoyed making friends with the players at the clinic and enjoyed seeing a few of the same individuals at the wheelchair tennis clinic on Mondays. Learn more about Biola athletics and Biola’s women’s tennis program.